American Sales and Service provides the option to rent our equipment. Automated truck wash systems are available on a pay per wash plan. 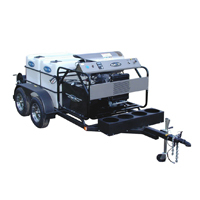 Stationary equipment can be installed and rented on a yearly basis and trailer mounted hot water washers are rented by the day, week, month or yearly. For your convenience and cost control, all rental equipment is serviced and maintained by American Sales. Lease purchase through a third party is also an option.